I’m Kelly. Twenty-nine years old from Santa Barbara, CA. Watercolor is the medium I landed on a few years ago, when I inherited my great-grandmother’s watercolor set, a beautiful tin box filled with some hundred year-old Windsor & Newton paints. A kind of fortunate accident but I think watercolor suits me well- it’s a medium that doesn’t usually allow for meticulous perfectionism, but plays well off of spontaneity and a willingness to adapt to change. I have never had formal instruction in watercolor technique, so sometimes to the demise of some of my pieces, I feel like I’m constantly learning as I go. Sometimes I finish in one sitting, sometimes I revisit the piece over the span of a few days, depending on factors that range from caffeine intake to my immediate personal connection with what I’m painting. I am a minimalist at heart, and love a clean aesthetic, which has resulted in most of my artwork hosting plain white backgrounds, with crisp contours and watery interiors. I’m lucky enough to have my father, who is a local contractor in town, build me some of my custom frames, which he has me sand and finish myself. Creating a piece from start to finish is always a really satisfying process for me. My sisters and I spent a lot of our time growing up outside, building forts, collecting bugs, playing in and around the ocean...our parents definitely fostered a creative upbringing for us, and their backgrounds in marine biology and commercial fishing undoubtedly gave us a special appreciation for the ocean and all it contains. I guess I’m obsessed with beauty- nature is complex and spontaneous and ordered and unpredictable and a bottomless source of wisdom all at once. 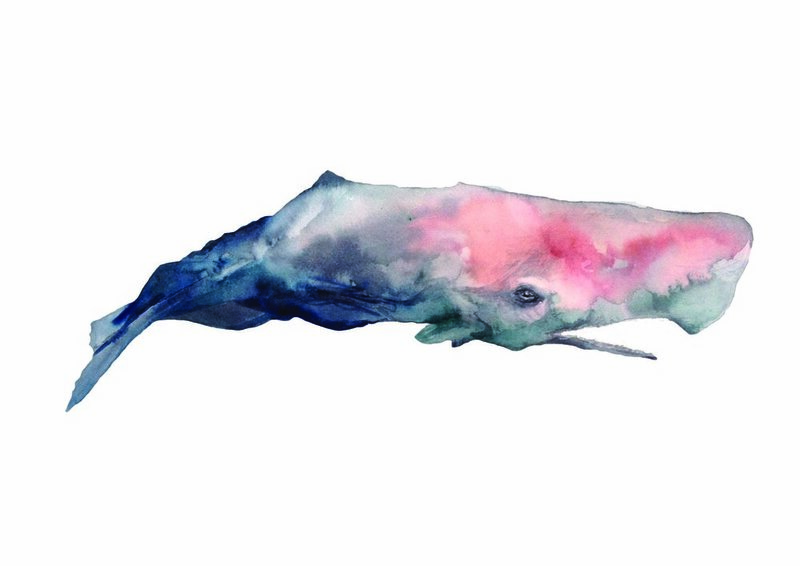 Painting for me is just an overflow of this fascination with the natural world- from whales to waves to trees and fish. I’ve always loved art, but never really thought about pursuing it more seriously until a little over a year ago. I tell people I had an early retirement, deciding at age 28 to quit my job as a teacher and pursue art full time. It’s been quite a wild and fulfilling year so far. What excites me most is when people have a genuine connection to my work. It’s one thing for me to be satisfied with something I’ve painted, but when someone else connects to it in a certain way, that’s what gets me fired up. It's pretty humbling how willing people are to let you into their worlds- I think art helps facilitate that vulnerability. Goals. I have a lot of them that change on the daily, but I think the overall concept remains. I want to partner with people who have stories needing to be articulated. I think art has a special way of communicating with people on a universal level. I would love to create art that visually represents someone’s journey--tells their story--and by doing so, ultimately educate or inspire the broader public on meaningful issues. The story of an Alaskan salmon fisherman who is committed to sustainable practice, a man in Thailand who teaches street boys how to sew leather bags to sustain themselves... I guess it could be considered "artistic journalism". And some more unrelated goals of starting a garden, taking a class on native plants, backpacking New Zealand, and owning chickens someday. A lot of time under the sun and in the ocean, hopefully with a good mix of travel and surf and hiking some good peaks in between (while not running out of money)...call it a day.